In the film, a stranger (Frank Whitten) appears in a remote New Zealand farmland at the exact time a farmer accidentally falls to his death. The mysterious outsider, a hunter, grows close to some of the dead man’s family, to the point where he and the widow (Penelope Stewart) become lovers. But her eleven-year-old daughter, Toss (Fiona Kay), struggling to come to terms with the death of her father as well as her impending womanhood, believes the intruder to be the devil and sets about protecting her family and their homestead. 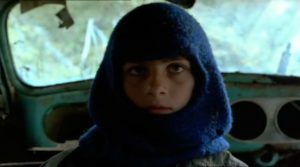 Critically lauded upon its rollout to the international film community and propelled by Fiona Kay’s outstanding performance by as Toss and cinematographer Alum Bollinger’s striking visuals, Vigil was screened at the 1984 Cannes Film Festival – the first time ever that a New Zealand feature played in the main competition.